Trump says ‘Now is not the time to talk to North Korea’–is there really a threat from North Korea? President Trump told British Prime Minister Theresa May on Tuesday he is not interested in diplomatic discussions with North Korean leader Kim Jong Un, according to a White House statement issued Wednesday. “President Trump reiterated that now is not the time to talk to North Korea, and made clear that all options remain open to defend the United States and its allies against North Korean aggression,” the White House Office of the Press Secretary said in a statement about the call. The two also pledged to work together on increasing diplomatic and economic pressure on the country, despite Trump’s message that now is not the time to talk. Is there really a threat from North Korea? Skepticism will vanish when the power suddenly fails across the United States. The North Koreans can reach the U.S. mainland with a missile, and it will survive reentry. 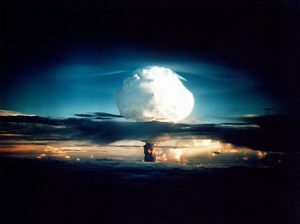 Yet, an emp attack could harm the USA and ultimately make it more susceptible to be taken over during World War III. A vengeful North Korea may have operatives try to detonate nuclear bombs and/or dirty bombs in the USA. North Korea may attempt to unleash chemical and/or biological weapons against the USA, South Korea, Japan, and/or Guam. Steps to prepare for some or all of this may have been begun by the North Koreans. North Korea’s leaders may well decide that if they are attacked that they should attempt to cause the most damage possible. An electromagnetic pulse weapon attack may well be involved. Where is it all going to end? That was the question the twelve disciples of Jesus Christ posed in the twenty-fourth chapter of Matthew. Christ’s answer, known as the Olivet Prophecy, is quite revealing. “And ye shall hear of wars and rumours of wars,” Christ said, referring to one of the prophetic signals that would herald the end of an age (verse 6). Certainly there have always been wars. And certainly Christ’s words had particular meaning for that day and age. Within a few short decades Roman legions under the command of Titus sacked, burned and pillaged the city of Jerusalem. But Jesus’ warning about war was also applicable to another period in history. In the book of Revelation, Christ, speaking through the apostle John, amplified some of His previous prophetic statements. In the sixth chapter, John writes: “And there went out another horse that was red: and power was given to him that sat thereon to take peace from the earth, and that they should kill one another: and there was given unto him a great sword” (Rev. 6:4). We are getting very close to this time. It could start this month. North Korea, and US President Trump’s reactions to it, are a threat to peace. North Korea poses a variety of threats to the USA. This entry was posted on Wednesday, September 6th, 2017 at 6:00 am	and is filed under Prophecy.